Sea Breeze, an active adult community in Lacey NJ. Sea Breeze Lacey is an Over 55, Active Adult community. It’s located in historic Forked River, NJ in Ocean County. This luxury adult community is in a good location, because it’s east of the Garden State Parkway, near Barnegat Bay. 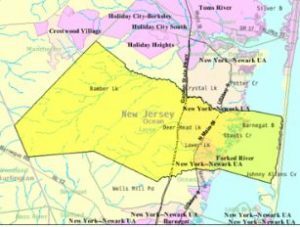 Actually, Forked River is an unincorporated area located within Lacey Township, and many people refer to all of Lacey Township as Forked River. Due to it’s location on Barnegat Bay, the area offers a rich and diverse lifestyle. You can enjoy local activities such as fishing, boating, shopping, dining and much much more. Sea Breeze has a homeowners association, thus a monthly association fee is charged., As a result, the HOA handles lawn maintenance and snow removal, not you. Sea Breeze Lacey is being built by Toll Brothers. It consists of 10 different models of homes, with either 2 or 3 bedrooms and 2 car garages. These upscale homes generally range from 1681 sq ft to 2490 sq ft. Also, some homes have 2 stories. The homes feature 10′ ceilings, granite counter tops in addition to all of the nice touches one would expect in this type of house. At the present time, since the community is new, there are very few, if any, resales available. However, new construction is available. The 13,000 sq. ft. community clubhouse offers many amenities. When it gets warm, there’s a heated outdoor pool and spa. Also, a state-of-the-art fitness center with aerobics and saunas. Additional outdoor activities include tennis and bocci courts, a putting green and walking trails. And when you’re indoors you’ll find card rooms, billiards, arts-and-crafts rooms and a coffee bar/lounge. The grand ballroom offers space for parties, dances, live entertainment and more. While Sea Breeze doesn’t have a golf course, there are many courses available in Ocean County. Also, there are many marinas for the boating enthusiasts. Sea Breeze Lacey is only 45 miles from Atlantic City, and minutes to the ocean.